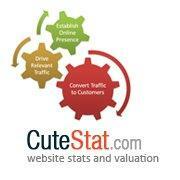 CuteStat is a best tool or an application which help users by analyzing a website to discover valuable insights, reviews, actionable lists to improve visibility and growth opportunities. Startup Ranking updated the Employees Number, 474 days ago. Startup Ranking updated the LinkedIn URL, 474 days ago. Startup Ranking updated the CrunchBase URL, 474 days ago.